NASHVILLE -- "Young” and “vibrant.” That’s how Billy Milam described Nashville. Milam, president of Atlanta-based RaceTrac, earlier this year announced the company’s entry into Nashville—its first new market in 15 years—with 30 new-to-industry stores featuring the food-forward, 6,000-square-foot “RT6K” design. In developing a short list of markets prime for c-store development, CSP found a divining rod in that notion of “young and vibrant” that extends past demographics and into lifestyle perks such as music festivals, dog parks and wine bars. And the power of millennials is only growing. Millennials will outnumber baby boomers by 2019, growing to 73 million compared to the once-dominant boomer segment, which will decline to 72 million, according to the Washington, D.C.-based Pew Research Center. Click here to read The 10 Best Spots to Build New C-Stores in 2018. As more retailers rev up to chase millennials, some of America’s historically alluring cities will lose their luster. In its study of 2015 data, SmartAsset, a New York-based financial-research firm, said the Big Apple saw the biggest loss in millennials among major cities. The six cities with the highest losses during its study period were New York, San Diego, Miami, Houston, Las Vegas and Chicago. SmartAsset said one of the biggest reasons millennials may be moving is that they’re attracted to cities with booming economies, implying that millennials are seeing less opportunity in these big-name, more established markets. The Midwest did not fare well in the study. It was not represented among the top 10 states where millennials are moving. And Ohio and Michigan ranked in the bottom 10 of the SmartAsset study. Conversely, the top five states desirable to millennials are Texas, Washington, Colorado, North Carolina and Virginia. 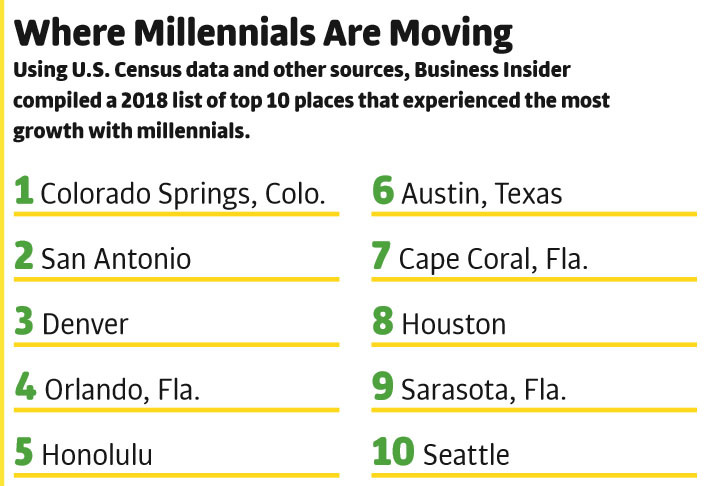 Cities such as Honolulu, San Francisco and Washington, D.C., score high for percentage of millennials and, more important, the number of millennials moving in. Unfortunately, those cities can be too expensive for retailers, both in terms of property development and day-to-day operations. Economic diversity. A city’s reliance on a seasonal population or a single business sector can leave it vulnerable to spells of feast or famine. Competition. A promising new investment can suddenly wither when a smarter operator or a cross-channel competitor enters the scene. Business climate. Taxes, regulation, zoning and permits all reflect a community’s desire or indifference toward new businesses. Net-growth rates. An influx of new bodies and employers is preferable to a market where the people are merely shifting from a suburban to an urban lifestyle (or vice versa). Insider knowledge. A tough market for one retailer may prove a winning bet for another, with local expertise, business relationships, brand strength, appropriate format and ability to work with area municipalities offering a competitive edge. That hometown advantage is also a factor in how retailers define a “new” store. Joseph Bona, president of Bona Design Lab, New York, says most of his clients are looking internally, reinvesting in current infrastructure. That’s not to say that QuikTrip is sticking close to home. Last year, officials announced a major expansion into Austin, Texas, and San Antonio, where the chain bought 18 properties this past spring. Those two Texas towns repeatedly come up in top lists for growing economies, as well as desirable places to live for both boomers and millennials. If Jim Fisher, CEO of Houston-based IMST Corp., were taking a red Sharpie and drawing a circle around hot regions in which to build new c-stores, he’d start at the southern tip of Florida, circle north over the Carolinas and go west over all the Gulf states to rein in San Antonio and Austin, Texas. The energy sector is playing a big role in this region, despite having hit a bust cycle earlier this decade. “It’s back now,” says Fisher, whose company helps retailers determine locations for new builds, existing facilities upgrades and potential markets to develop. Many Southern cities such as Houston have moved beyond relying on the energy industry for their livelihood, broadening their economic bases. Attractive markets have strong, diverse economies, as well as all the amenities that a workforce wants to be around. This creates a chicken-or-the-egg scenario, Gross of RGDE says. However, there is a caveat: Net population growth within a market is critical, Gross says. For example, asset management firm AllianceBernstein recently moved 1,100 employees from its Wall Street digs in New York to Nashville. It’s a net growth for Nashville, but part of an ongoing decline for metro New York and New York state. “In order to feed people, you need bigger lots, more parking." Chasing the flow of people is part of the formula for Murphy USA. After a 20-year relationship with Walmart, Murphy severed ties with the big-box retailer in 2016. As Murphy completes its upgrades of stores that are still on Walmart lots, it looks to expand elsewhere. Along those lines, knowing about households in the area as well as local industry is a priority, Gross says. Those numbers correlate to traffic flows not just when people are at home but when they’re at work. In addition to understanding traffic and forecasted household trade-area spending patterns, knowing who the competition is and who else is on competitive routes is also important, Gross says. In a way, retailers need to predict the potential for competition—and opportunity. For example, an agricultural area could suddenly be rezoned for residential, office or mixed use. Finally, retailers should never underestimate the local communities, Fisher of IMST says. For example, when he arrived at a project in Kansas, he was met by two dozen city representatives, including the mayor, director of economic development and local CEOs of major companies in the area. His point: Being sensitive to the local jurisdiction may open doors for retailers. Many of these difficult neighborhoods are affluent and in need of c-stores, but they want to maintain the charm and character of their unique communities, Gross says. Success for c-stores going forward means “decoupling” the food offer from the fuel, possibly placing pumps behind the lot to make the store the “hero” of the site, Bona says.